NMM 5893. 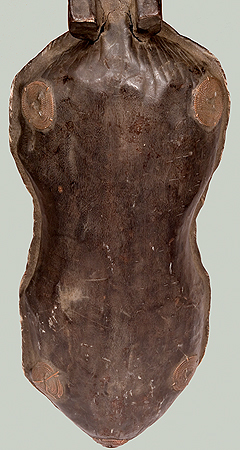 Arched harp (donnu) by Mangbetu people, Uele river region, Belgian Congo (now northeastern Zaire), ca. 1910-1920. The twisted copper wire depicts the geometric, dotted, linear body painting favored by Mangbetu women. 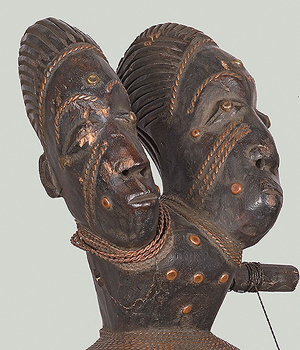 The elongated heads represent the Mangbetu's Queen Nenzima and King Yangala. Neck length: 29¾"; body length: 25½"; width, upper bout: 10-5/8"; width, lower bout: 10¾"; Board of Trustees, 1995. 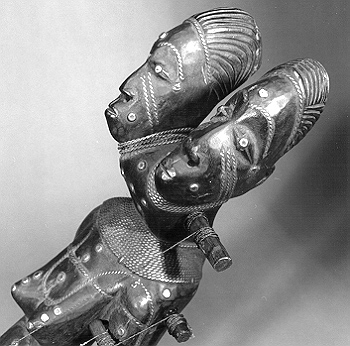 The full-figured female torso that serves as the harp's neck is surmounted by two heads, traditionally said to represent the Mangbetu's Queen Nenzima and King Yangala. The placement of the tuning pegs and five strings to the right side of the neck are typical features of Mangbetu harp construction. 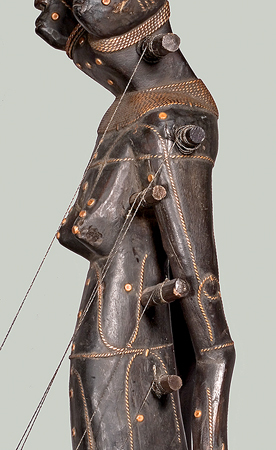 Although anthropomorphic harps are closely associated with the Mangbetu, stringed instruments are not indigenous to their culture. 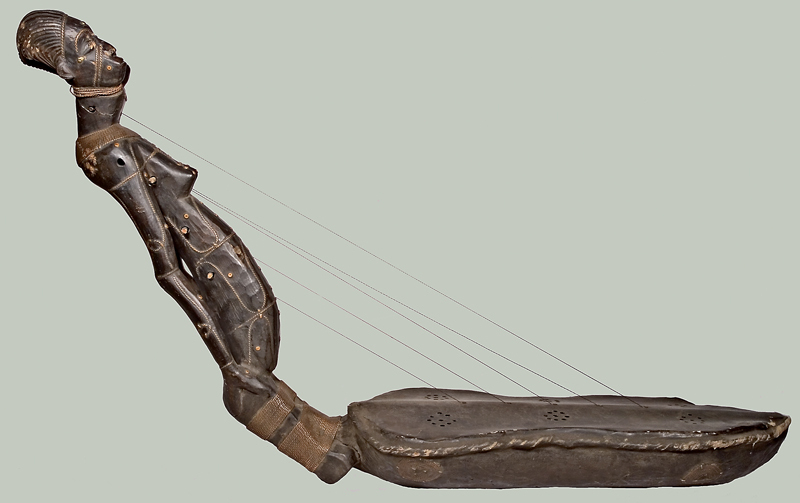 In fact, the path by which the harp was introduced to the Mangbetu is the subject of much debate among scholars and can only be documented back to the last few decades of the 19th century. 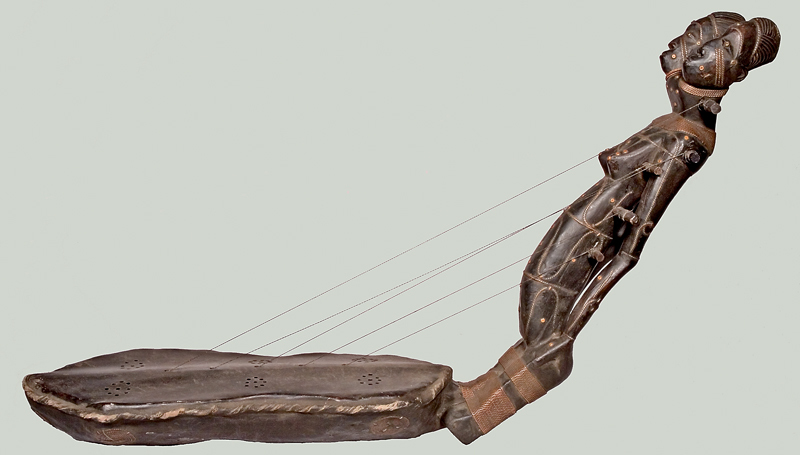 As an instrument used only by men for their personal entertainment, the harp played no role in the extensive musical repertoire that accompanied the Mangbetu's significant political rituals. Several more specific features of this anthropomorphic harp link it to the Mangetu people, including the characteriscally elongated, wrapped head with a customary Mangbetu coiffure. 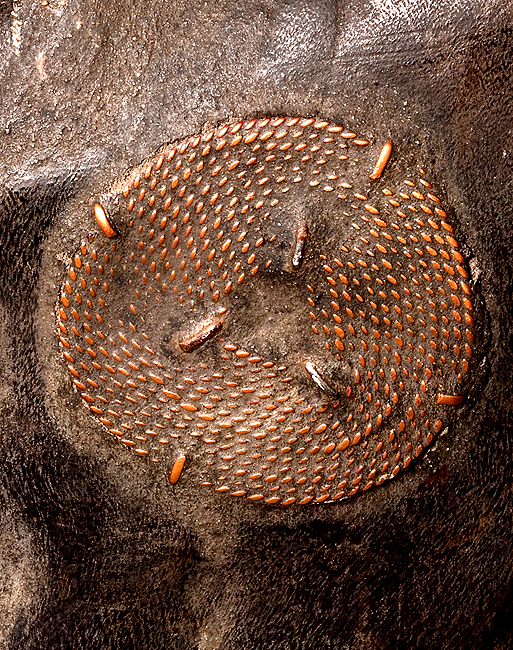 In addition, long strips of tightly twisted copper wire are used to depict the geometric, dotted, and linear body painting favored by Mangbetu women. Click here for a link to information about headshaping and head-binding among the Manbetu and other cultural groups. The popularity of the donnu at the turn of the 19th to the 20th century was short-lived, and the ornately carved harps are no longer a part of the Mangbetu's rich musical culture. It has even been suggested that the harp may once have been less important to the Mangbetu as a musical instrument than as an art object to be traded for economic advantage with the Europeans. Literature: Margaret Downie Banks, "Anthropomorphic Harp a Link to Zaire's Colonial Past," The Shrine to Music Museum Newsletter, Vol. XXIII, No. 3 (January 1996), p. 5.